Project taken from initial proposals for alternative uses and then on to the design and build to create an exceptional wedding venue. 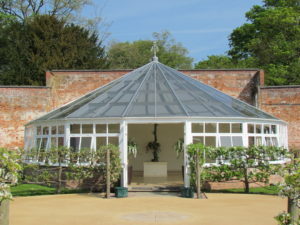 A combination of modern materials and traditional craftsmanship was agreed to reinstate the shape and feel of the substantial Glass-house, producing a truly unique end-product, sited within an extraordinary site (fruit tree maze planted in 5 acre Walled Garden). 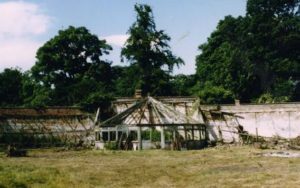 Using the footprint of the derelict glasshouse, complete demolition of the rotten remains was required ahead of rebuild from the ground. The new structure used modern slab glazing combined with traditional timber framing, as well as terne coated Zinc over part of the roof. The open plan space was maximised to contain 110 people in theatre style seating or 150 with standing. Support facilities of catering kitchen and toilets were incorporated in the adjoining back buildings behind the walls of the garden, previously gardener’s potting and mushroom sheds! Askari wrote and presented the detailed Business Plan to justify the required capital outlay and bank borrowing. This feasibility study was based on anticipated expenditure to be set against the proposed future event target income, necessary for payback. After demolition, the rebuild and reinstatement of the new structure was managed by ASKARI taking care not to impact the surrounding, semi mature gardens. The transition brought together experts in their field (eg. Glaziers) with normal Trades people and all was monitored closely to ensure the structure was ready in time for the first engaged couple to tie the knot (having booked 12 months beforehand). Size – 2,000 ft2 of licensed Wedding premises for holding Civil Ceremonies with support buildings (catering kitchens, loos, ante-room) and car parking all included. Capacity for up to 110 people.